Jumbo template upgrade. Make your jig investment work harder for you! Expand the versatility of your Gifkins finger joint or dovetail joint jig by purchasing a Jumbo template upgrade. finally, a pair of backing boards. For the specifications for each template see VIEW TEMPLATE SPECS. Select a template model and quantity using the options on the right. Then ‘add to cart’. Repeat the process for each different template type. 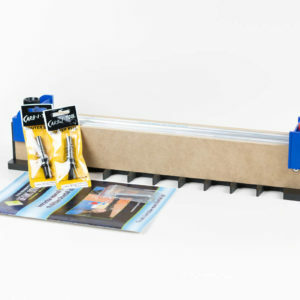 Gifkins Dovetail produces the only Australian made jig for cutting through dovetail joints and finger joints. We make a beautifully designed tool that delivers precise joints every time. No measuring! No fiddling! No fuss! Call us any time if you have questions about purchasing the Jumbo template upgrade pack Col 0411-283-802, Pam 0411-589-539.